Henley, Great Britain. Cambridge University coxswain, Russ Glenn, holds his hand up to indicate to the umpire his crew is not ready to start their heat of the Ladies Challenge Plate. Photo by Peter Spurrier. The old adage that the only stupid question is the one you don’t ask doesn’t always apply when speaking with college coaches. Your questions tell the coach something about you. Good questions are the ones that speak to your specific concerns, communicate your sincere interest in the team, and are best addressed by a coach. The worst questions are the ones that show you don’t really care, like asking for information you can readily find on the program website. In many instances, you will want to go to the student-athletes themselves with your questions rather than the coaches. They are more likely to speak the unvarnished truth, while the coach will be motivated to paint the program in the best light. It’s also important to know your place. 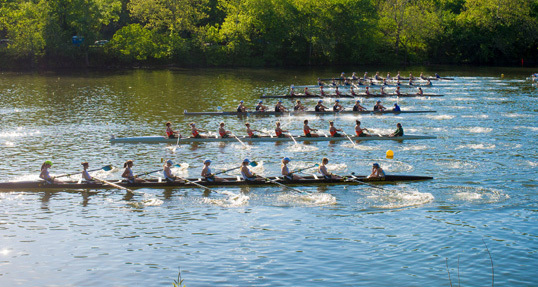 Most college coaches are turned off when a 17-year-old asks, “What’s your coaching philosophy?” You’re not interviewing the coach for a job and you’re certainly not ready to answer a question about your rowing philosophy, so stick to the basics and use your powers of observation to see what the coach believes. College coaches want prospects taking initiative and leading their own college search. Prospects should communicate with the coach. Parents do, however, have an important role in the process, particularly when the talk turns to finances. Prospects are often most interested in how recruiting works at a particular school. They want to know if they can get a scholarship and/or if a coach can “support” their application with admissions colleagues. These are valid concerns. But they need to show the coach why they deserve a scholarship or their support before asking whether or not they’ll get it. To go fast this summer, go long this spring. Check out August’s racing calendar from our July/August issue.